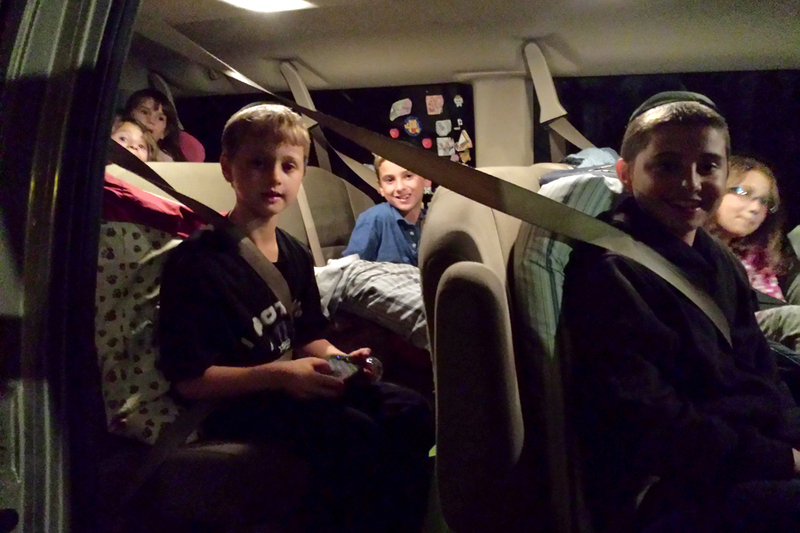 I spent much of Friday packing up the house and getting ready for the long drive to our hometown, where for the next month we’ll be spending time with family and friends while celebrating the upcoming Jewish holidays. 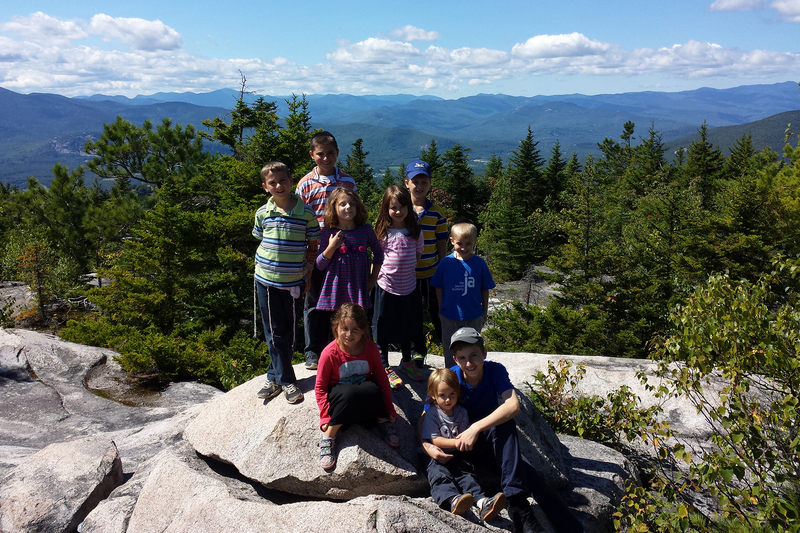 I couldn’t help but feel a bit wistful that this year’s timing of the Jewish calendar meant that I would miss the peak of leaf-peeping season, not to mention the greatest time of year to go hiking. I decided right then and there that I would make the most of the short time remaining to me and drove to Evans Notch with my dog riding shotgun. 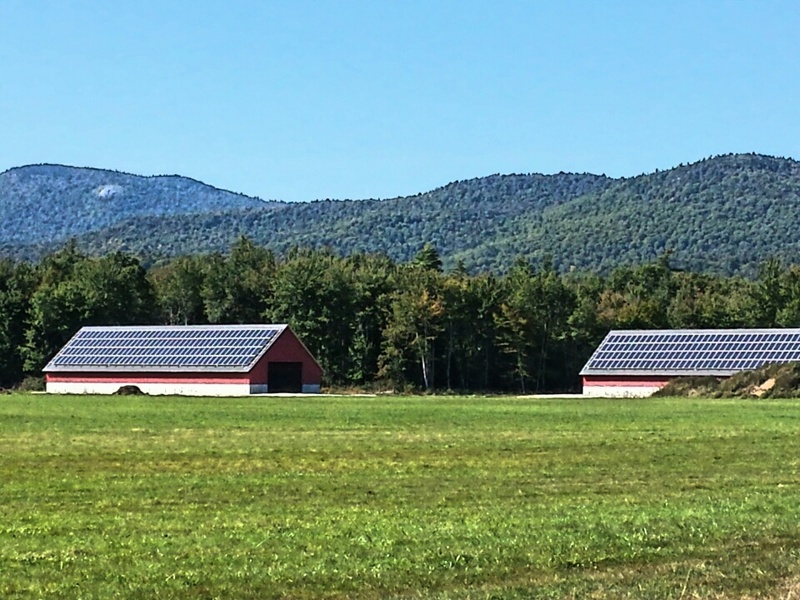 I passed these two huge barns on a country road in Chatham NH, being powered by an immense solar electric system that stretches across both roofs. The barns were empty. I am so curious to know what they are powering! 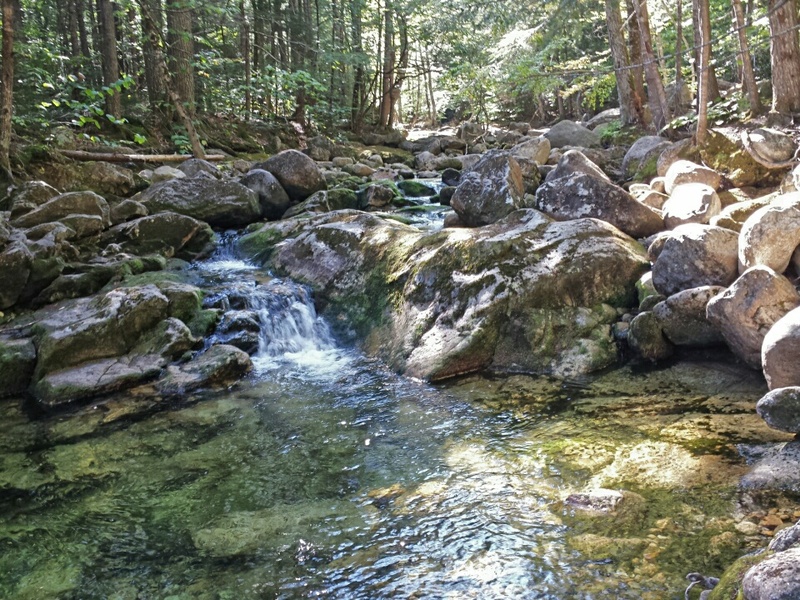 There wasn’t time for a serious hike but that would not stop me from going for a beautiful walk through the woods on the beginning of Baldface Circle Trail to Emerald Pool. 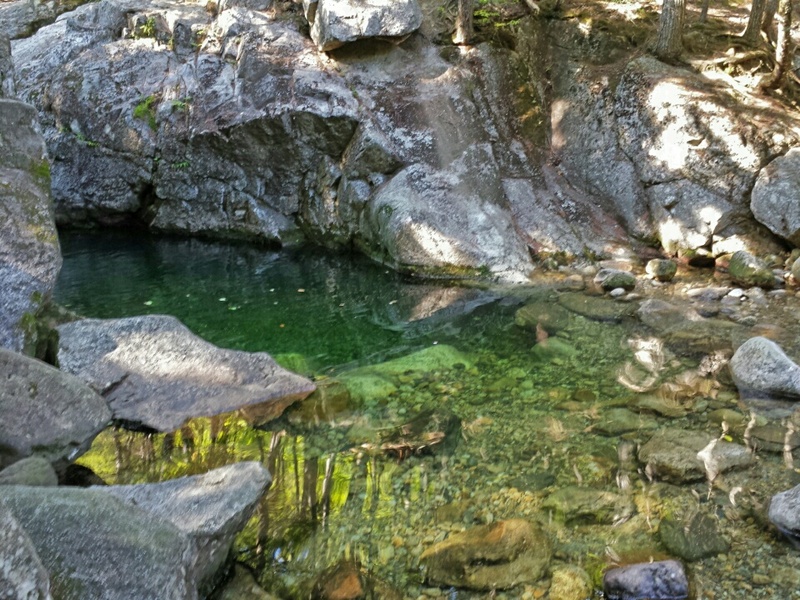 It is immediately apparent how Emerald Pool got its well-deserved name. Emerald Pool lives up to its name. It is a popular swimming hole for locals in summer, and the upper rock is used as a diving board. We didn’t have time to go further on the trail, where it continues to Chandler Gorge. It’s incredible to think that much of this walk is on private property from which its generous owners permit public access, providing hikers don’t wander carelessly off the trail. Think about it: the more precious the object, the more likely we are to guard it and keep it for ourselves. That’s just human nature. It takes a special spirit, and someone who understands the true meaning of love (love = giving), to know that it’s even more special to share than to hoard; to be selfless rather than selfish. Most of the time reward comes with effort… and rarely without it. With every disappointment and when there is no reward, it’s not the end of the world. Life is short yet time is relative. It marches slowly when the kids are small and moves too fast when you are old. Silence can be both loud and quiet. Both types teach us to really listen, if we are willing to hear. No matter how external events wreak havoc, and have the power to poison and destroy, evil is not permanent and HaShem is eternal. Happy New Year! Wishing my friends, family, and readers a year of multiple blessings, good health, and peace. Yesterday should have been a terrible day. Our car was making a weird vibrating noise, and I knew I’d have to take it to a mechanic. My tooth had been hurting me, and I was pretty sure it was going to have to be extracted. I made an appointment for the dentist, who is located 90 minutes away in Scarborough, Maine (yes, there are closer dentists, but I have terrible teeth and he came highly recommended; I’ve been happy with him so far). I decided that rather than go to the nearest Subaru dealer to my house, 45 minutes away, I would go to the Subaru dealer in Saco, which is closer to the dentist in Scarborough, and kill two birds with one stone. When I called the Subaru dealer, I told them that I would need some sort of loaner car because I had a dentist appointment 8 miles away. “I’m so sorry,” the Subaru technician replied, “but all of our loaners are out. But it’s no problem – – we will take you to your dentist appointment with our shuttle driver; just call us when you’re ready to be picked up.” The shuttle driver was so nice. We spoke about those things we had in common: the secrets for a good marriage (the driver recently celebrated his 42nd anniversary), grandchildren, our dogs (both rescues), and fishing (what else do you talk about this time of year?). Meanwhile, at the dentist, the news was not good. “Yep, it needs to be extracted,” my dentisit said, “but you will need to go to an oral surgeon for that. But I knew you were coming from very far away, so just in case, I called them this morning to see if they could fit you in today, and I made you an appointment for 2 o’clock.” I called the shuttle driver and he brought me back to the Subaru dealer. My car was in very bad shape: it needed 2 new axles, CV boots, and struts. Because we commute 600 miles each way between Maine and our home town on a frequent basis, we need our car to be in tip-top condition, so I authorized the repair. . . sigh. . . our tax refund just went out the window. I thanked him profusely and in fact the repaired car drove like new. I told him that in the future, despite the distance, I would return to his dealership for service. “That’s very nice of you,” he replied, “and we appreciate your loyalty. So I’m going to knock off 5% from parts and labor from today’s bill.” It was over $100 savings. And here’s my point: in Maine, people are almost universally nice. It doesn’t matter if you are in a store, on the road, or in a line. People are incredibly considerate, friendly, polite and helpful. What should have been a very difficult day was made better simply because people were pleasant, and their positive attitude was contagious. Now that the days are sunny, windy, and nippy, with brilliant blue skies and thick, puffy white clouds; the nights frosty; the leaves changing colors and the bugs long dead and gone (yay! ), everyone you meet seems pretty chipper. Mainers really make the most of this fleeting, wonderful time before winter approaches. 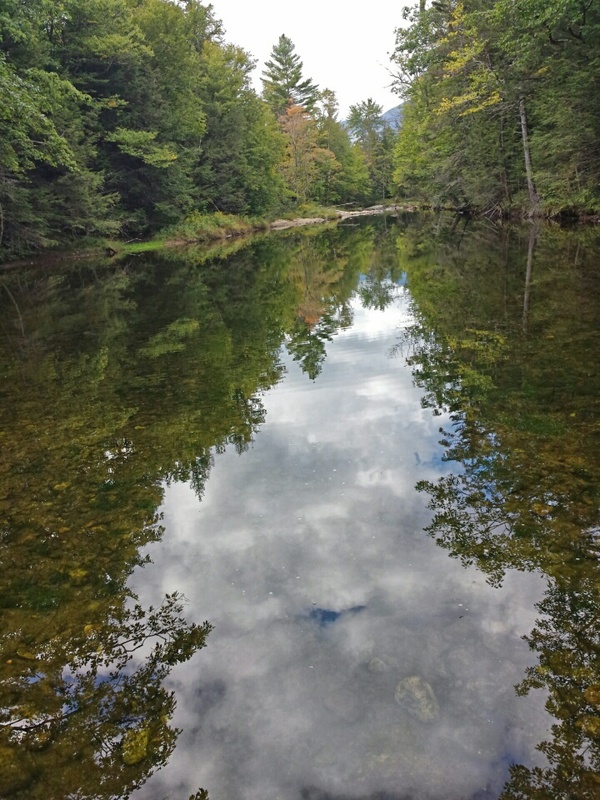 Mainers love their autumn, and with good reason. They decorate their homes in homage to Fall with pumpkins, Indian corn, gourds, welcome flags with Fall motifs, and autumn-themed tschotckes from the dollar store — and this is before Halloween when decor gets really elaborate. 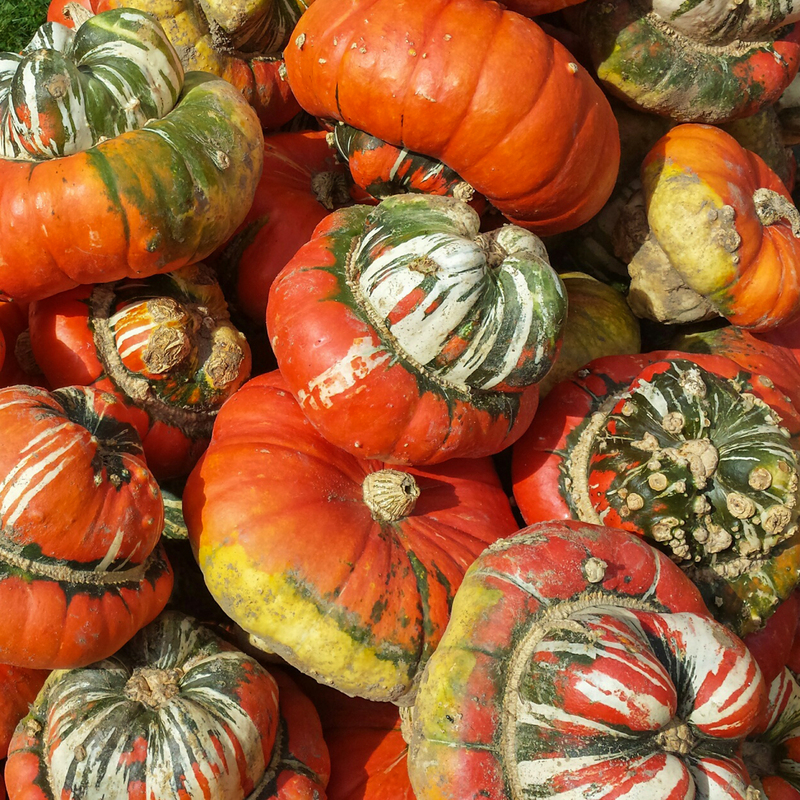 The farm stands are awash in color: gourds and pumpkins, apples and cider, and mums and asters. Hayrides and corn mazes and pick-your-own apple orchards are everywhere. 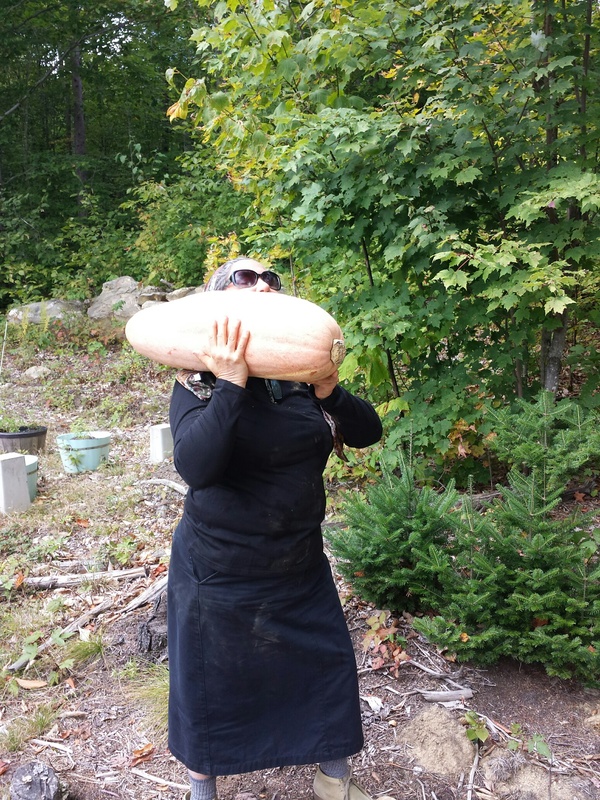 Communities have “harvest suppers” in which farms donate their produce to church ladies and Town Halls, and they have meals made of local produce, poultry, and pork that feed hundreds, either free of charge or to raise money for various causes. Hunters are centering their rifles and shotguns and practically chomping at the bit for deer hunting season to commence. It is the last hurrah before bad weather and short days set in. And of course the cider presses are working overtime, squeezing the juice from heirloom cold-hardy apple varieties you’ve likely never heard of: William’s Pride, Macoun (a common Maine favorite), Beacon, Chestnut Crab, Duchess, Snow, Wealthy, Black Oxford, Fireside, Liberty, Lodi, Milden, Paula Red, Northern Spy, Pristine, Snowsweet, and Wolf River. Many of the orchards have on-site bakeries where they sell fresh apple cider donuts. The aroma is intoxicating! 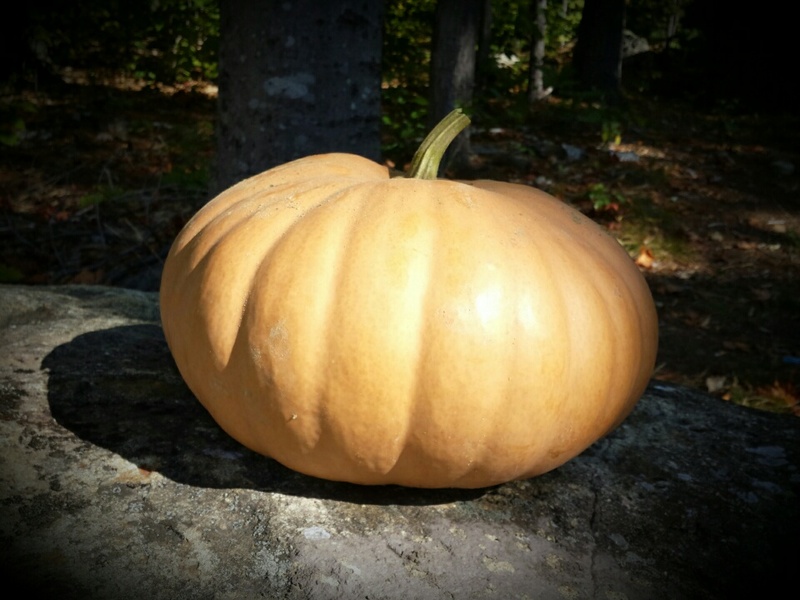 Today I drove past Weston’s Farm in Fryeburg, Maine, where I took all these photos, and just couldn’t help myself: I had to buy their appealing selection of pumpkins, squash and gourds. If you’ve never tried Delicata squash, do anything in your power to find some. 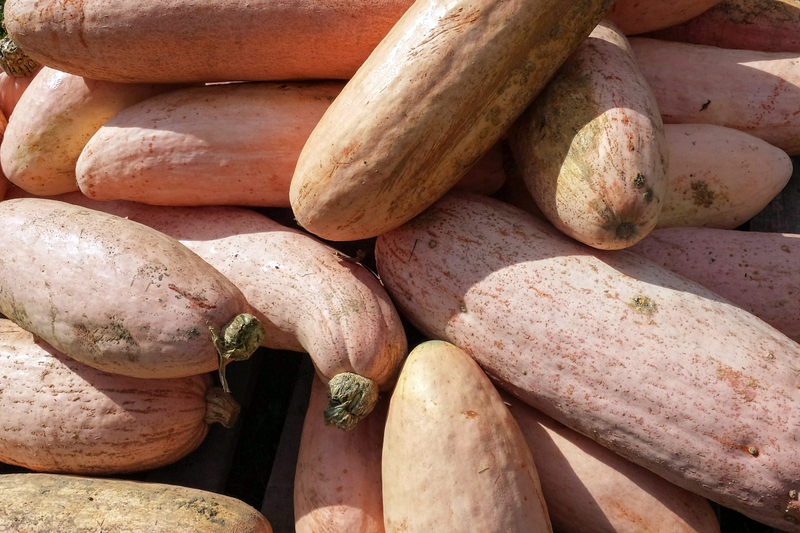 You might never eat any other kind of squash (including butternut squash!) again. 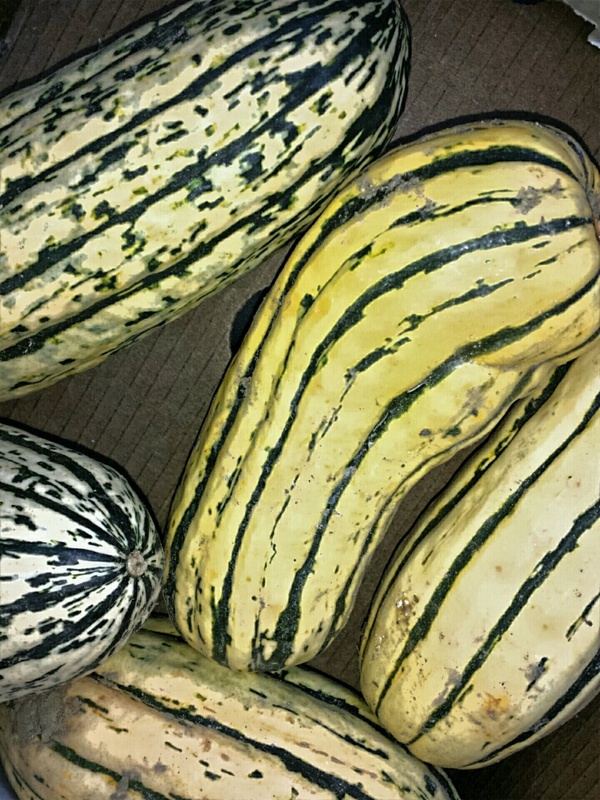 Delicata is the sweetest and most moist of all squash varieties I’ve tried. 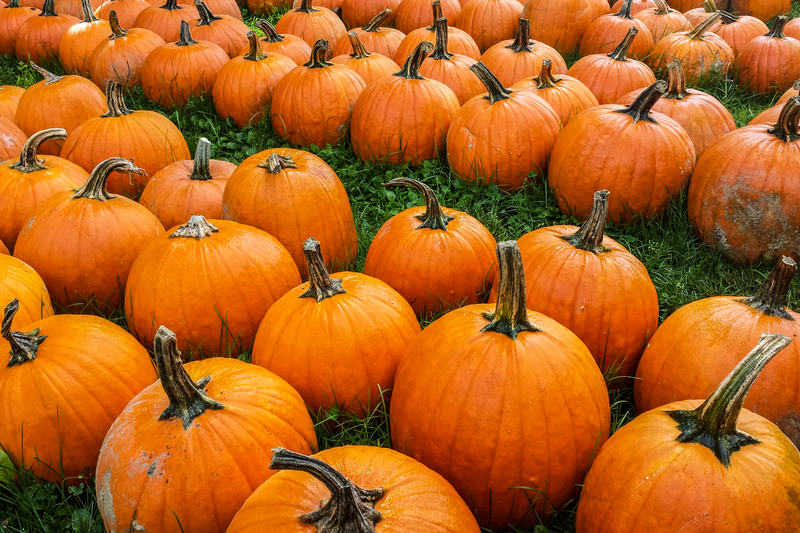 This paler variety of pumpkin is better for pie-making. The rind is somewhat thinner. 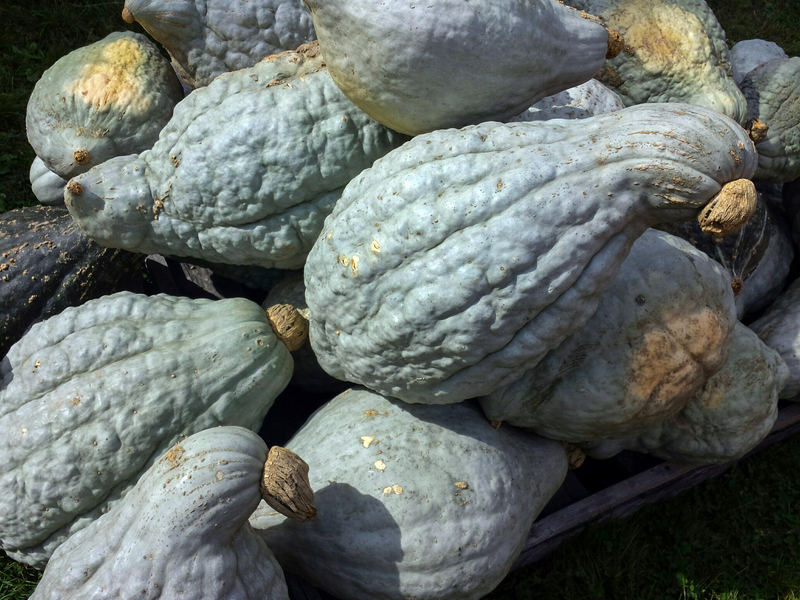 There is also ugly blue Hubbard squash which is a old-time favorite in Maine; I hope to try it soon. 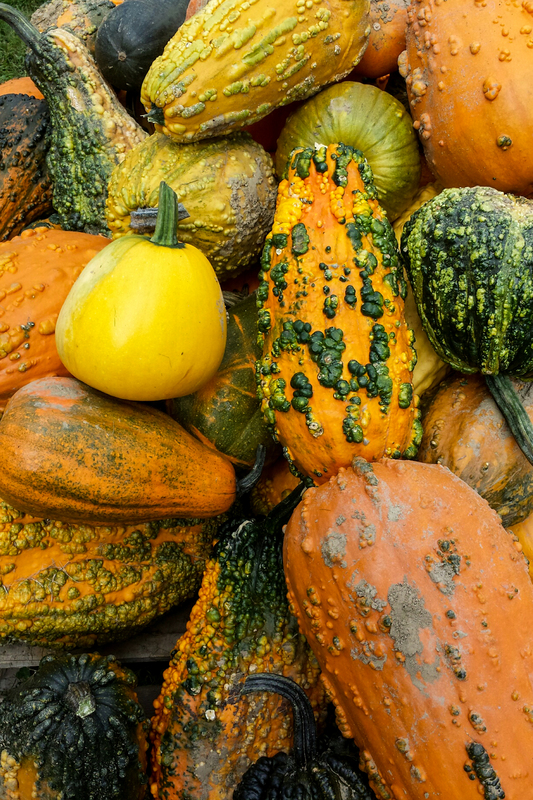 There were several types of Hubbard-like squash, which is a sickly blue-grey that resembles the color of mould. When I saw their wicked pink banana squash I got very excited. I had tried it 2 years ago and loved it, but hadn’t been able to find any since. 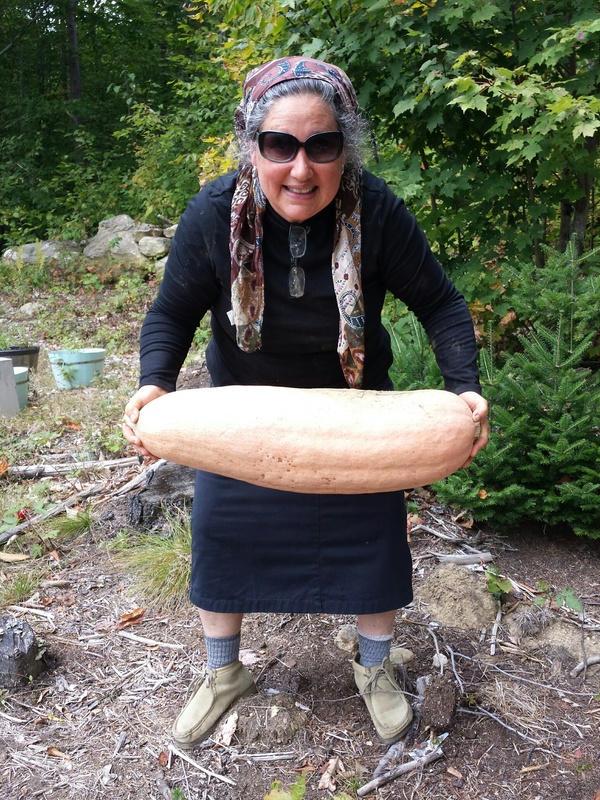 It’s not hard to see why: few people want to buy a squash that weighs between 30 – 40 lbs! The one I chose weighed 29 lbs. 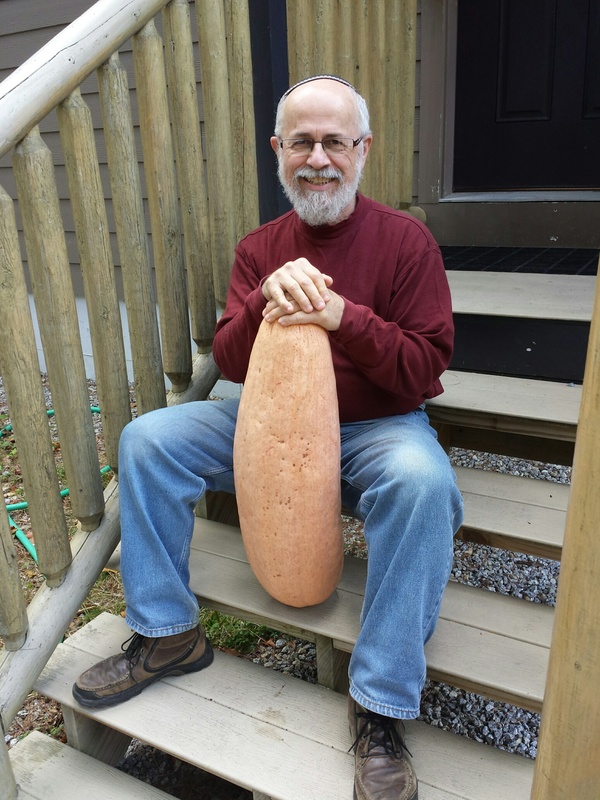 I’m taking it to my hometown this weekend; I figured its size would delight my grandchildren and then I can split up more manageable portions amongst my daughters and daughters-in-law. I knew my husband would roll his eyes when I came home with this. But both of us always love the unusual, and once he was convinced it wouldn’t go to waste he thought it was pretty neat. Isn’t it funny how memories and precise details from one’s childhood stay with you? And then, when you’re an adult, you return to that place where you grew up, and suddenly your home, your bedroom, the living room, the backyard, and the streets all seem so much smaller than you remember, even though you were so sure you recalled everything from your childhood home exactly as it used to be? Well, I guess a sure sign I am getting older is that I’m regressing. 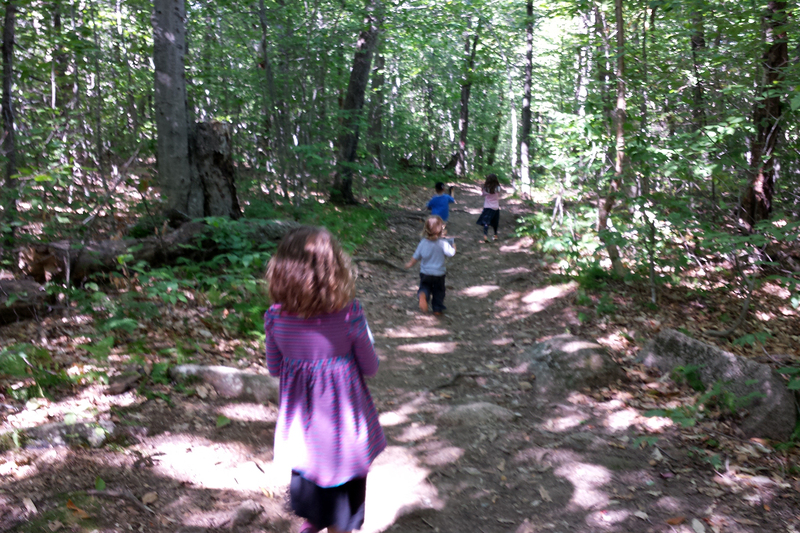 Because today I went on a hike in Evans Notch to Little Deer Hill and Big Deer Hill. I had done this hike many years ago, and I thought, “Well, that’s a relatively easy hike, perfect for a day like today.” The hike was not long, but it was not what I remembered in terms of being “easy.” I was huffing and puffing up Little Deer Hill to the top, then down the other side, then huffing and puffing up to the top of Big Deer Hill, and then the entire process repeated itself in reverse. Either I’m just older and tired and in much worse shape than I used to be, or I remembered the steepness of the climb with nostalgia rather than any sense of accuracy! My hike began at the Baldface Circle Trail parking lot on Rte. 113 in Chatham. 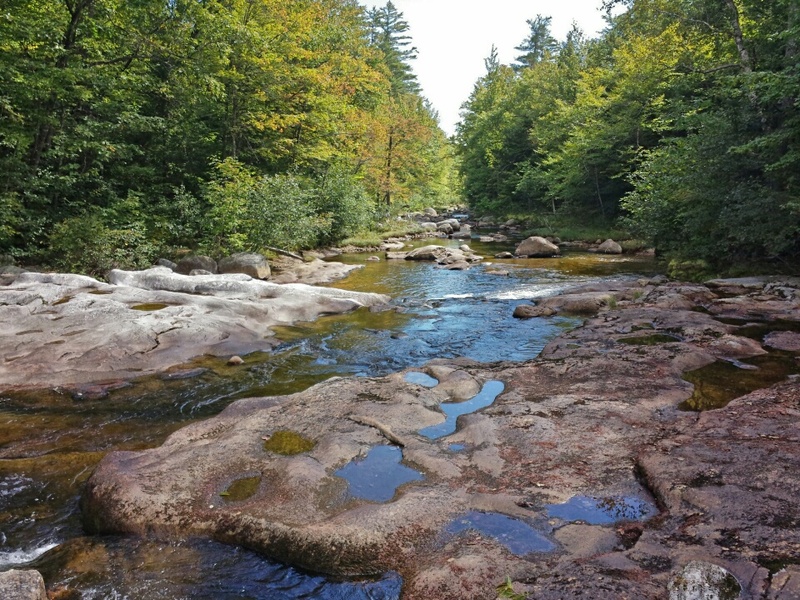 After walking on a wooded trail next to a brook, one passes the Applachian Mountain Club’s Cold River facility, which is off a little side trail. But I forged ahead, crossing the Cold River and beginning the short but steep ascent. 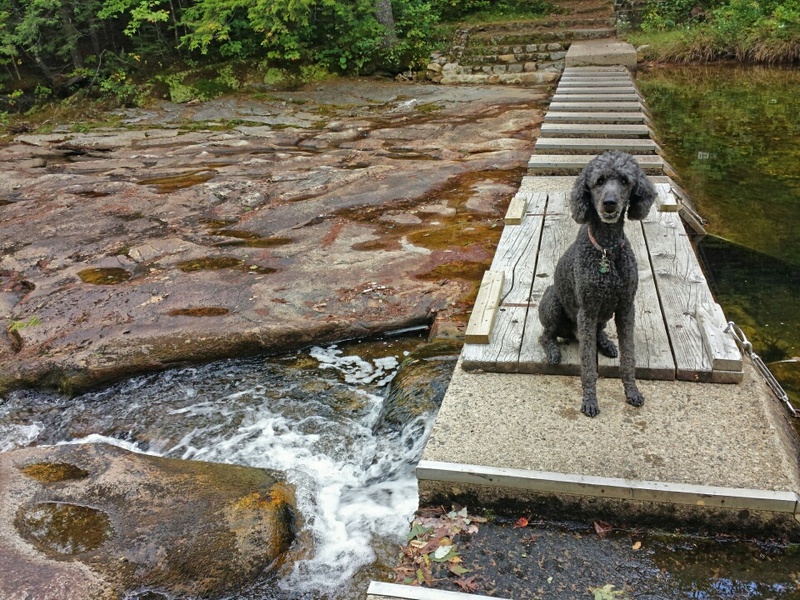 By the dam over Cold River. The beautiful reflections had a painterly effect. 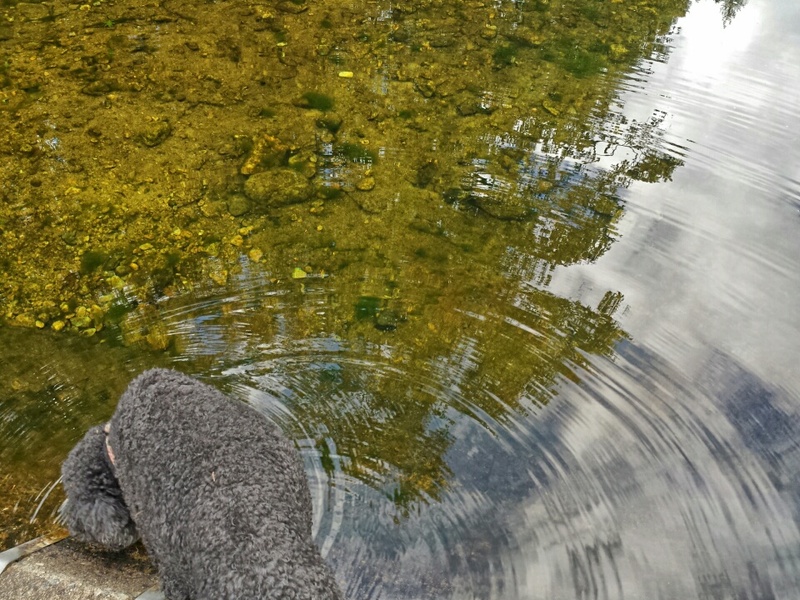 Spencer disturbs the calm of Cold River and its clear reflection when he stops for a drink. On the other side of the dam on Cold River. The water happened to be low on this day. 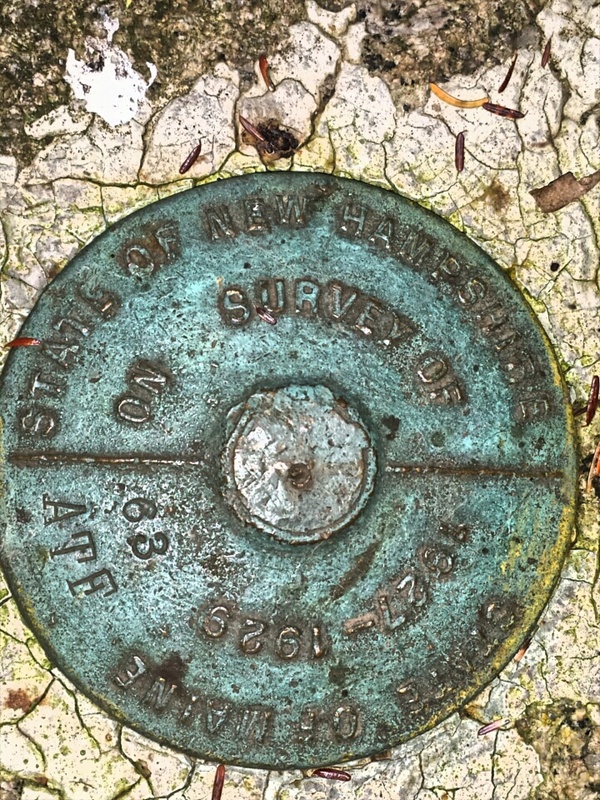 Shortly after the Cold River crossing, you will pass a Forest Service marker on a post, delineating the Maine-New Hampshire border. About 2/3 of the way up, there is an open ledge that gives a hint of the beautiful views to come. 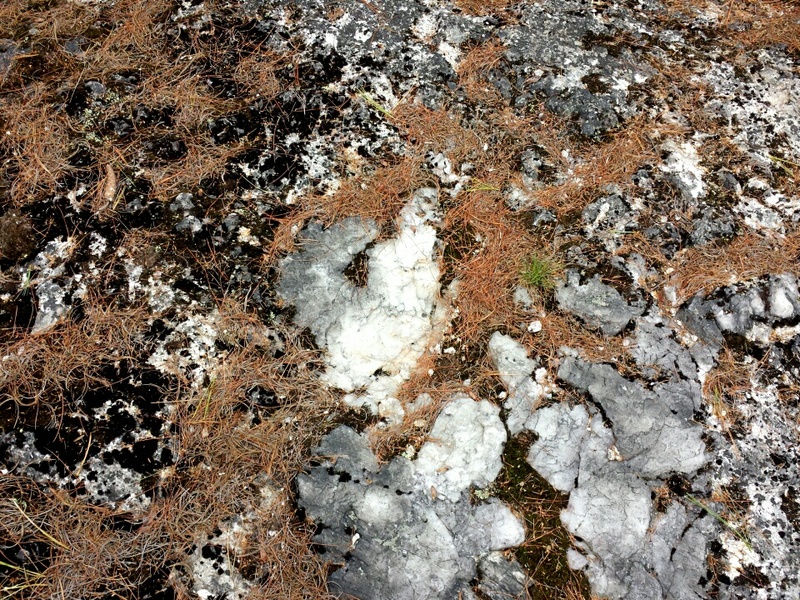 There were many areas where quartz and mica were prominent on the ledges. The white stuff is quartz. Up, up, up to the top of Little Deer Hill. The view (scroll up to see the very first picture) faces Evans Notch and the Baldface Mountains in New Hampshire, and looks down to Rte 113 where there is an architecturally-interesting luxury home that is built in the round. 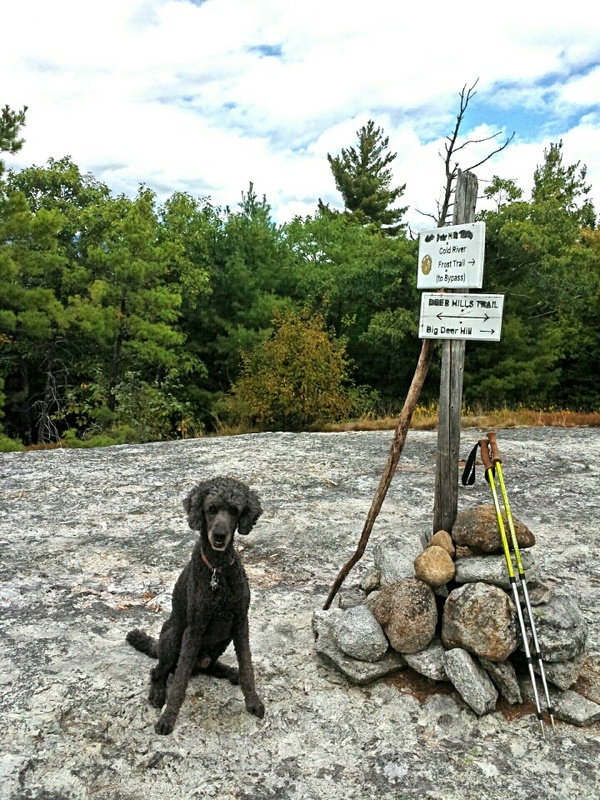 Spencer at the summit of Little Deer Hill. I think he looks pretty good for age 11, don’t you? From the top of Little Deer Hill I descended to the bottom on the other side, and then began yet another steep but short climb to Big Deer Hill. All along the way, heavy deposits of mica and quartz glistened in the sunlight. Deer Hill used to the be site of a mineral mine where according to the US Forest Service website, “large quantities of amethyst (purple quartz) along with many other minerals, including feldspars of many varieties, beryl, garnet, columbite, pyrite, and muscovite.” It is still possible for rockhounds to try their luck there. A permit is required but there is no fee. The view from the top of Big Deer Hill looks southeast. You can see Deer Hill Bog in the foreground below. That is the site of a huge blow-down during severe weather that occurred in the 1980s, which dramatically altered the wooded landscape. The beavers moved in and it’s been a bog ever since. There is a blind there where one can observe wildlife unobtrusively. We saw a total of two moose at Deer Hill bog on two different days in early summer this year. Both cow and bull were grazing on the far shore. 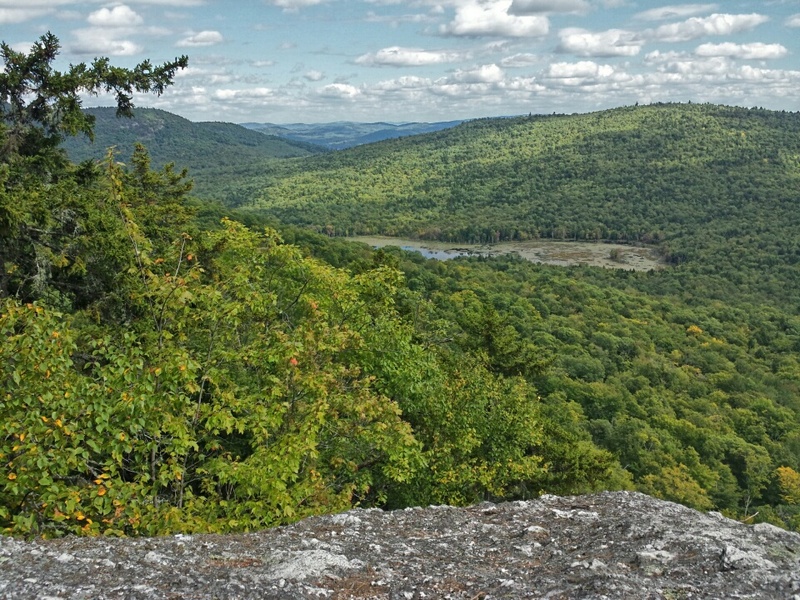 Panorama view from the top of Big Deer HIll, looking into western Maine. To the far right in the distant background is Pleasant Mountain (click to enlarge). Deer Hill Bog is the sliver in the middle of the photo. It’s located only 4 miles from my home. In the farthest background is Pleasant Mountain, located at the base of Moose Pond in Bridgton Maine. In summer this is a pleasant hike; in winter it serves as a very reasonably priced ski resort for locals. 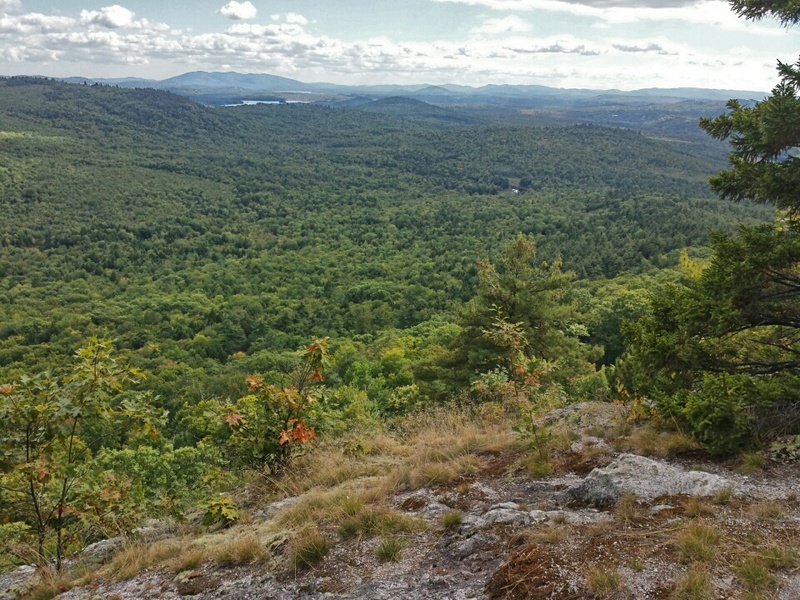 Pleasant Mountain, this time in the far background on the left. Now try to imagine these same views two weeks from now, at the height of Fall colors! 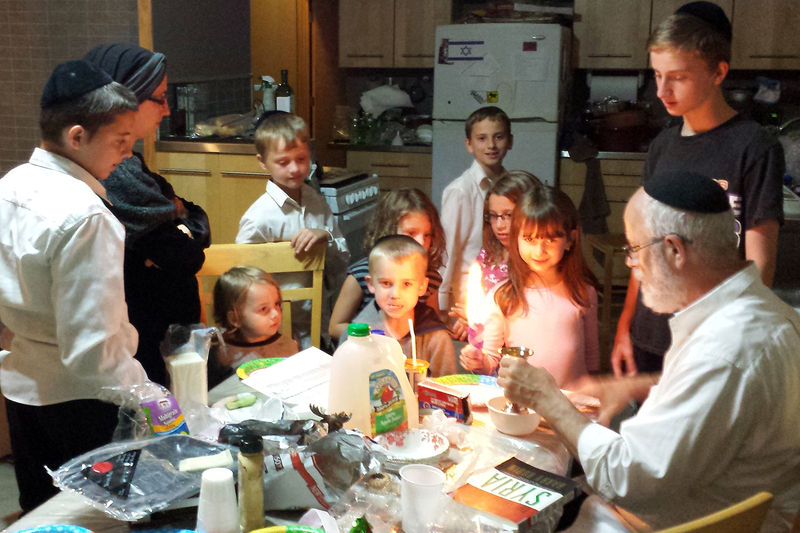 As we approach Rosh HaShana (the New Year according to the Jewish calendar), many Jews try to prepare spiritually in advance of that important day. 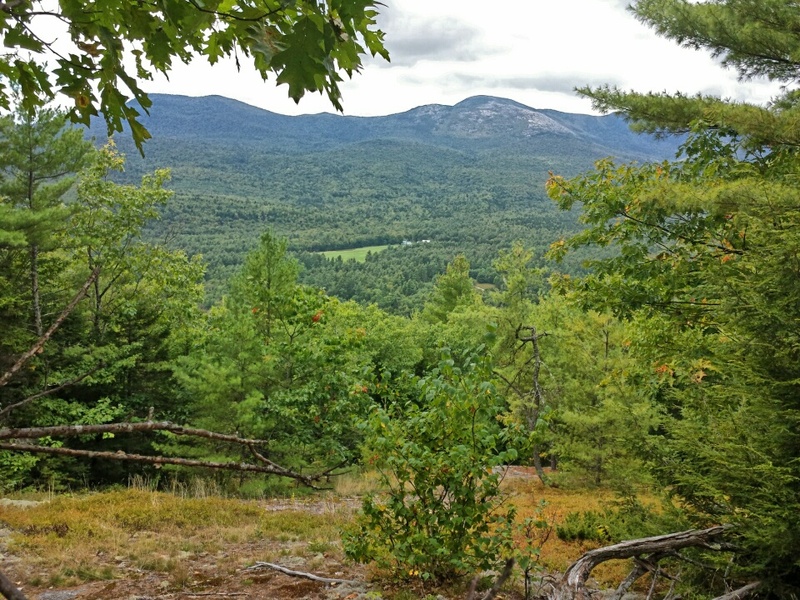 It may be unconventional as compared to what Jews in cities do, but I cannot imagine a better way to prepare then going for a hike in the White Mountains, where I gaze upon the glorious world G-d has made for us to enjoy and sustain; to acknowledge His kingship and rule over the entire world; to be humbled as I appear but a dot on this grand horizon; and to express gratitude that I am alive to experience and be part of it – – and hopefully will be for many years to come. 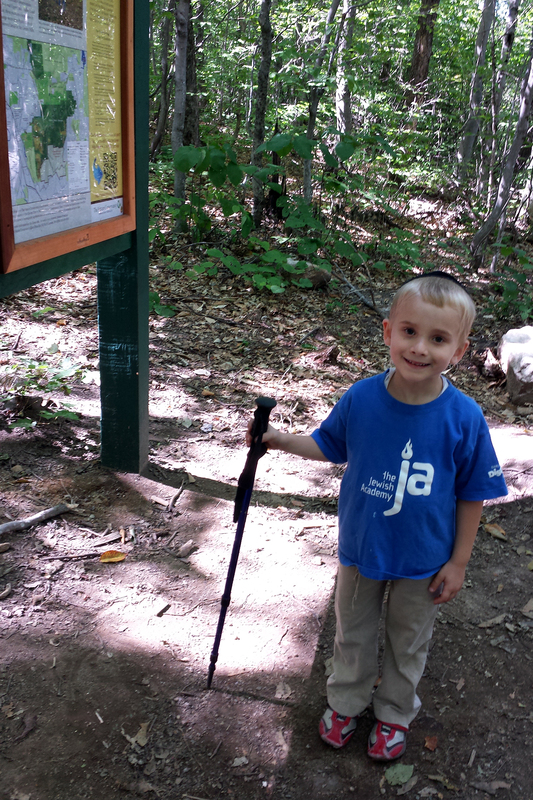 This past Sunday we had planned on doing a big hike but life intervened, and my husband had to work. 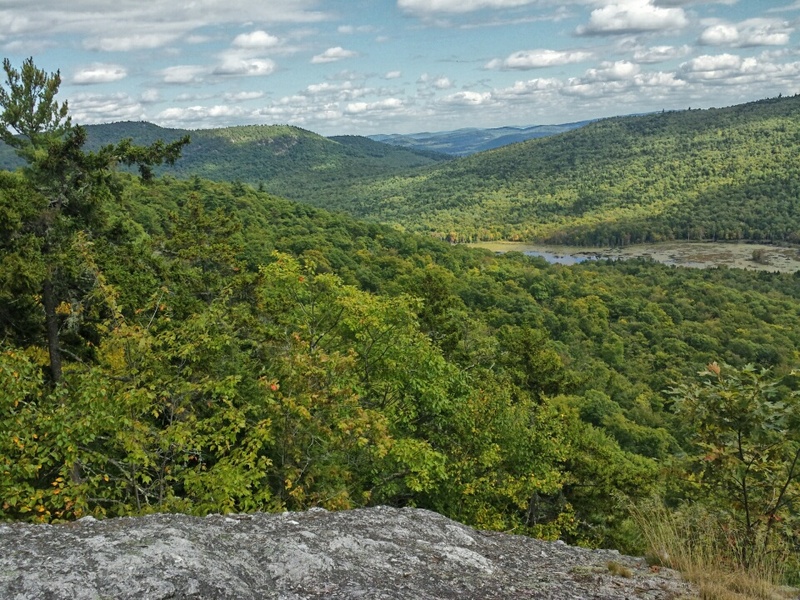 September is arguably the best time of the entire year for hiking. The temperatures are cool but sunny, with brilliant blue skies; the leaves are starting to change; there are also no fallen leaves as yet to cover tree roots, potholes and other tripping hazards; the lack of leaves also makes the hiking trails still visible; and best of all, NO BUGS! Rather than hike alone, which I can do any other day of the week, I decided to use the day doing all the chores that would put our house into “autumn mode.” We will be leaving Maine this weekend for the duration of the Jewish holidays, and returning next month when the cold has already set in, so spending the day preparing the house in this way was quite sensible. First I went through our closets and drawers, making two piles: “Put Away” and “Give Away.” The put-away pile is all our short-sleeved and lighter weight shirts, pants and my skirts, and socks. Then I brought down our huge storage bin of warm clothes, and filled the closet back up, this time with turtlenecks, sweaters, and down vests and jackets, tights, wool socks, and long underwear. Next to the front door/mudroom I replaced the bug net hats and bug spray with wool hats, gloves, and blaze orange vests (for hunting season, so we won’t be mistaken for a deer by hunters who might be a little trigger happy). I also brought out the winter blankets. 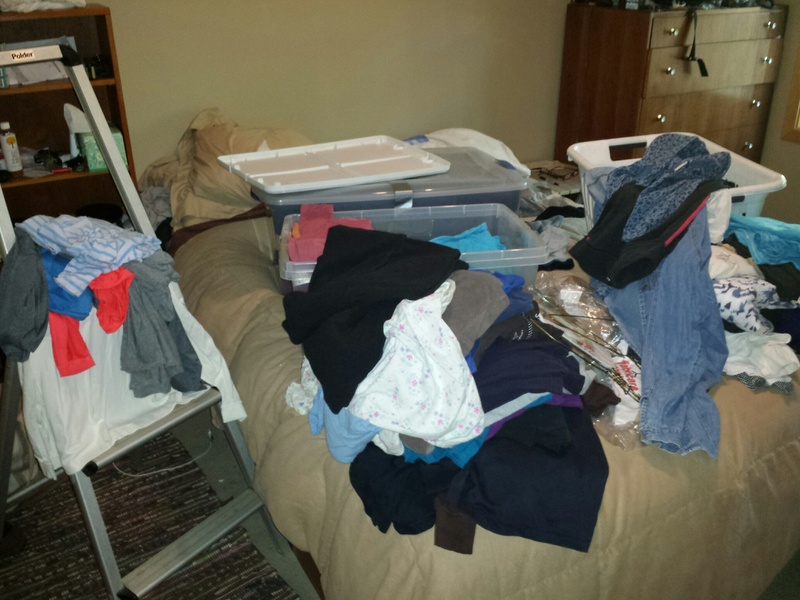 This mess is part of the closet changeover process from summer clothes to winter clothes. Then, with some regret, I started uprooting my garden. The temperatures are such that at this point, nothing is going to ripen further, and weather reports are now calling for frost at night. So I decided to pick whatever was left (a few red peppers that never got red, a couple of tomatoes and lots of green tomatoes, the rest of my kale and Swiss chard) and put the spent plants into my compost bin. 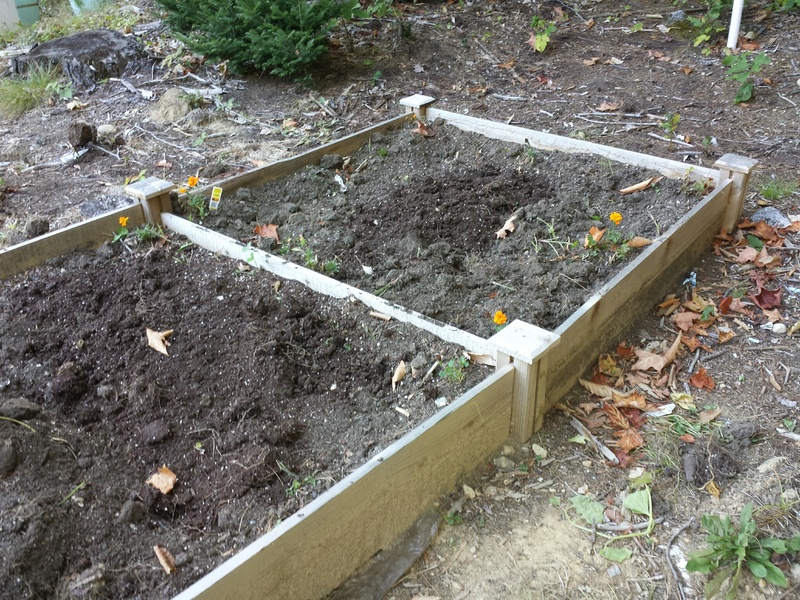 I turned and smoothed out the soil and added a few scoops of compost. I will plant lots and lots of garlic in October, so now the space is ready. I am pretty much done with fishing for the year (although I am hoping to try ice fishing for the first time this coming winter) so I dumped the tub of live worms that were stored in my fridge into the garden soil. I cleared out the veggies. Now making this raised bed ready for planting garlic bulbs. 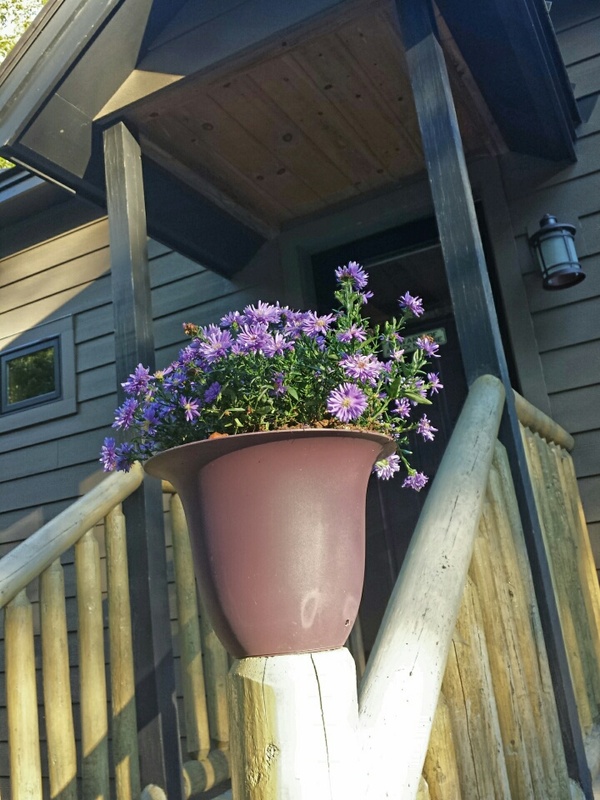 I also replaced my tired purple petunias by my front door with some cheerful purple asters. 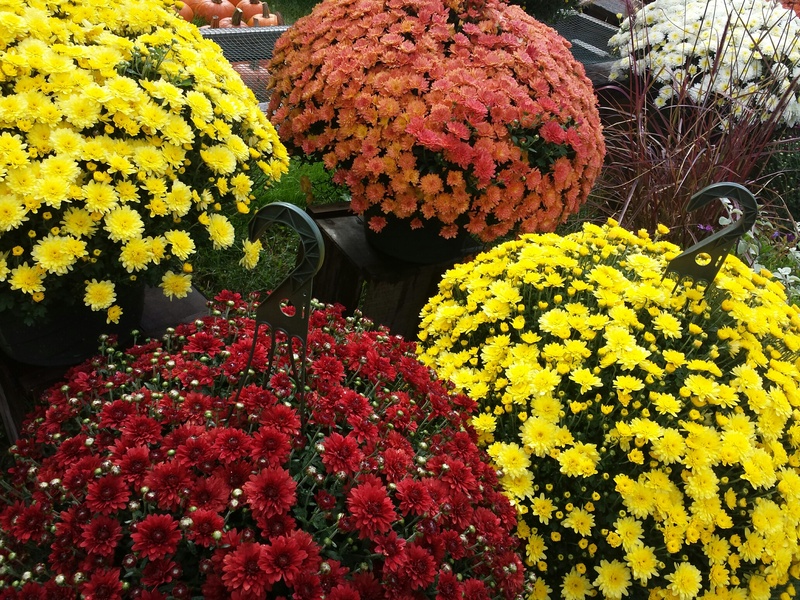 Right now every store in rural Maine is fairly bursting with mums and asters (and pumpkins, which came in early this year, and corn, which came in late). Then it was on to the screen porch. We took out the screens; I hosed them down and once they were dry, put them into storage until next Spring. Acrylic panels went up in their place. The nice thing about the panels is that when the sun is out, even in freezing temperatures, the porch gets to about 65 degrees thanks to passive solar. 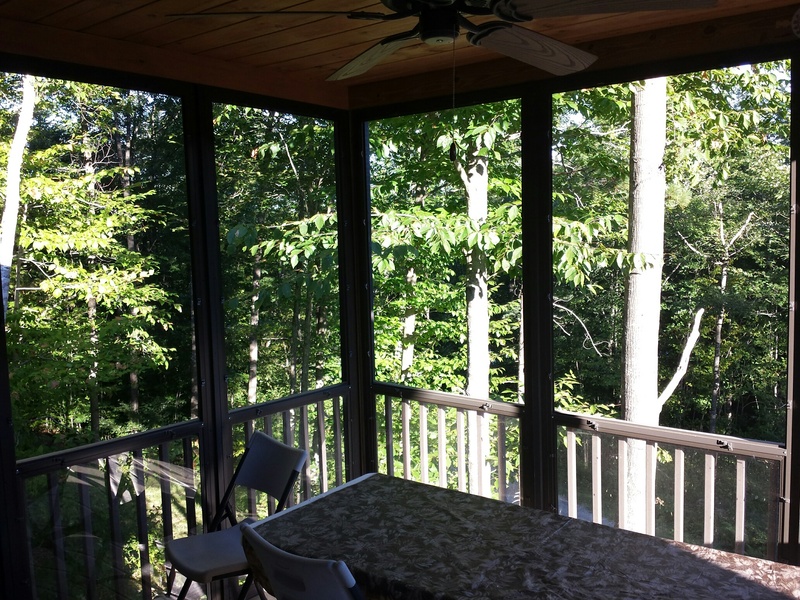 Our screen porch. The screens are removed and awaiting clear acrylic panels. 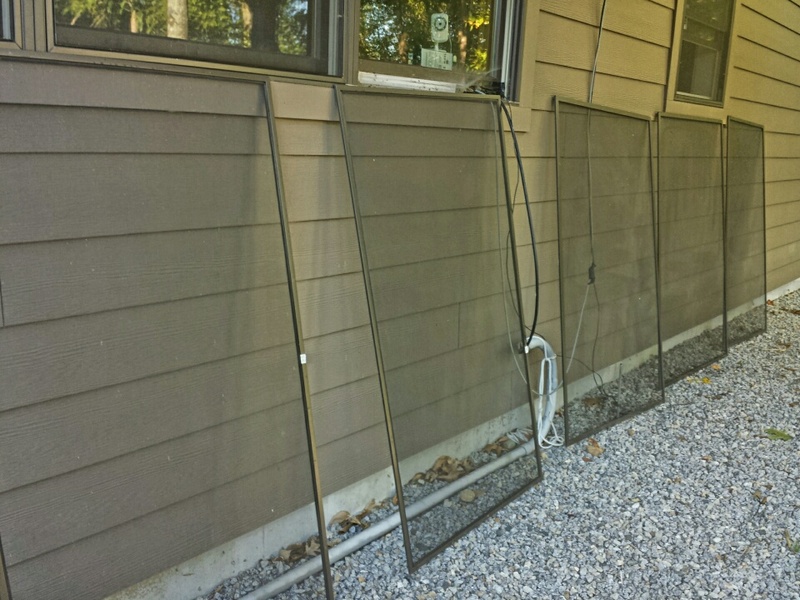 I scrubbed the screens, put them in the sun to dry, and then stowed them in the basement until next Spring. Next came the wood shed. Currently we have an over-abundance of cut and split wood due to some trees we took down last year. 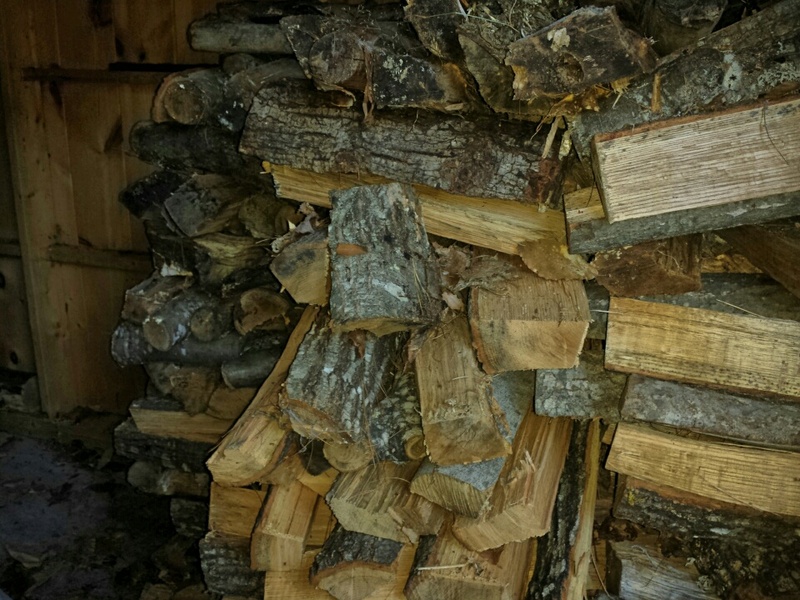 They have been drying outside on the wood pile all year and now it was time to stack the pieces neatly inside the wood shed. Our house is so energy efficient that despite last year’s long and brutal winter, we only used 1.5 cords of wood! (Typically people might use 6 – 9 cords to heat a house sized like ours, so this is really fantastic.) We still have plenty of wood stacked in the shed from last year, so I could only bring in about 1 cord’s worth as there wasn’t room in the shed for more due to the wood that was already there. So I got out some large tarps and covered the wood pile, where it will continue its “seasoning” process (drying) for another year. I also gathered kindling and put that in a pile, and brought several logs into the house since we will be using our woodstove for the first time this year any day now (according to weather reports, evening temperatures will be below freezing by the end of the week). 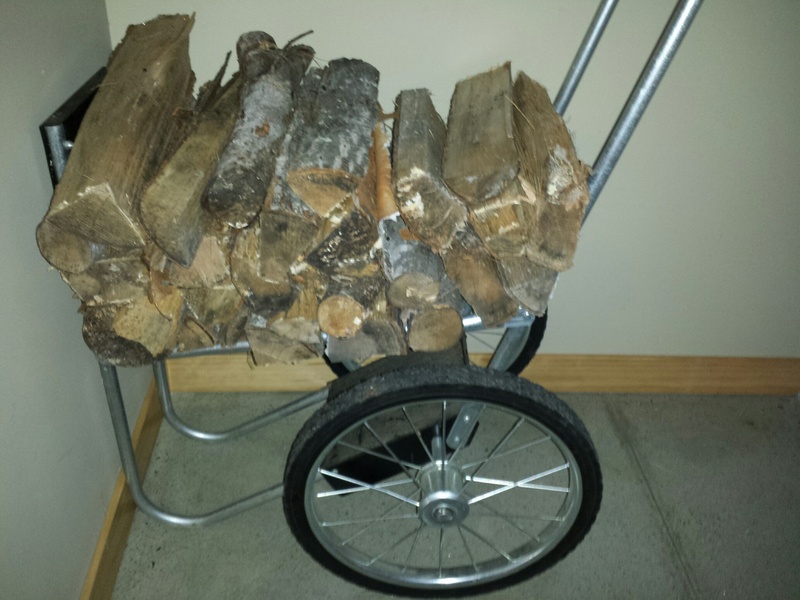 Bringing some logs indoors for our woodstove. Once my husband finished work, he did the final year’s weed-whacking (the bees, who get grouchy in colder temperatures, were not too happy with him getting close to their hives, and a dozen started swarming him. He was lucky to get only one sting.) I removed the summer tools from the shed, cleaned them and put them in the basement along with tomato cages and flower boxes, and took out the autumn and winter tools (rakes, shovels, and the long-handled scraper that takes excess snow off the roof) and put them where they’d be handy when needed. 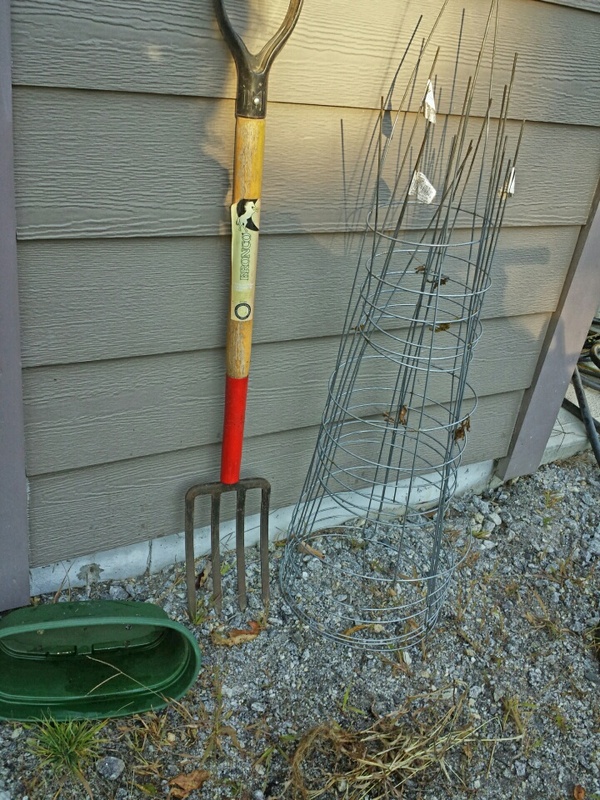 Putting away garden stuff till next Spring. 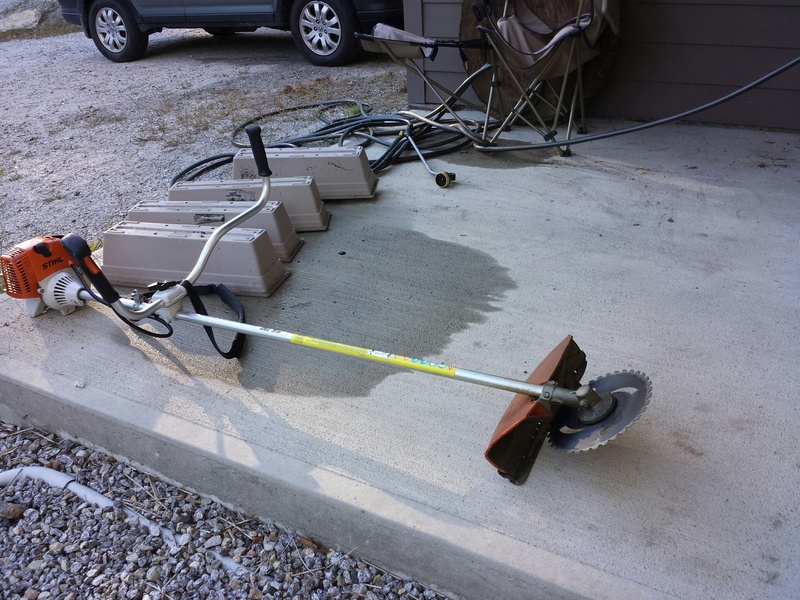 The weed-whacker has been emptied of gas, and will be stored till Spring, along with some now-emptied window boxes that held flowers. By now I was getting hungry and a bit tired. That’s when I remembered the huge kosher rib steak that’s been sitting in my freezer for a special occasion. 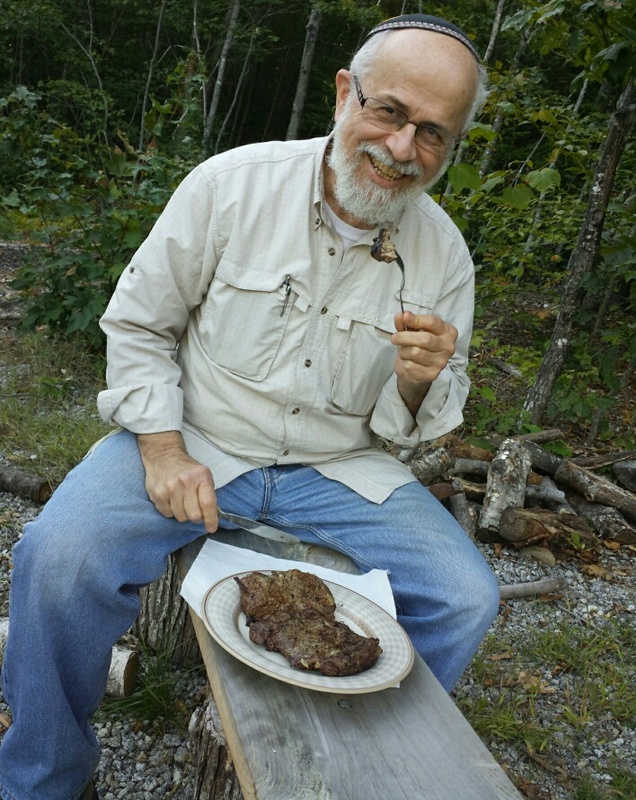 I originally planned on grilling it for our 37th wedding anniversary last week, but we ended up going to a friend’s wedding on that day and we had dinner there. I thought a grilled steak would be a great way to officially end the summer. 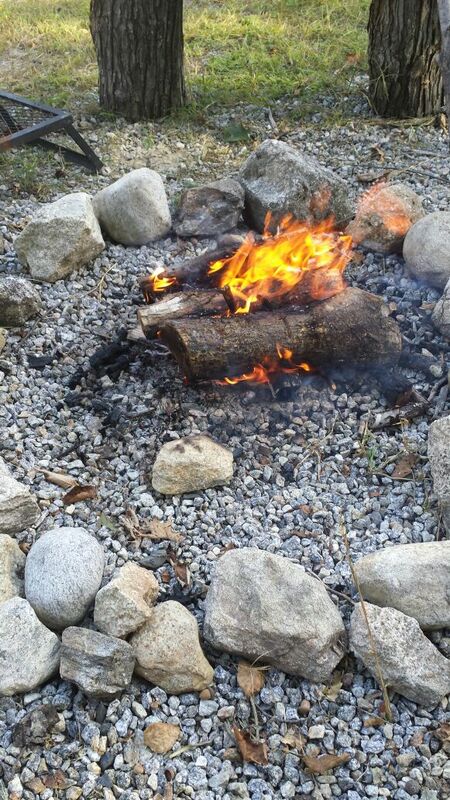 So we put some logs on our fire pit, made a campfire, and when the fire died down I started grilling the steaks for my husband (I don’t eat red meat) and a turkey burger for myself. 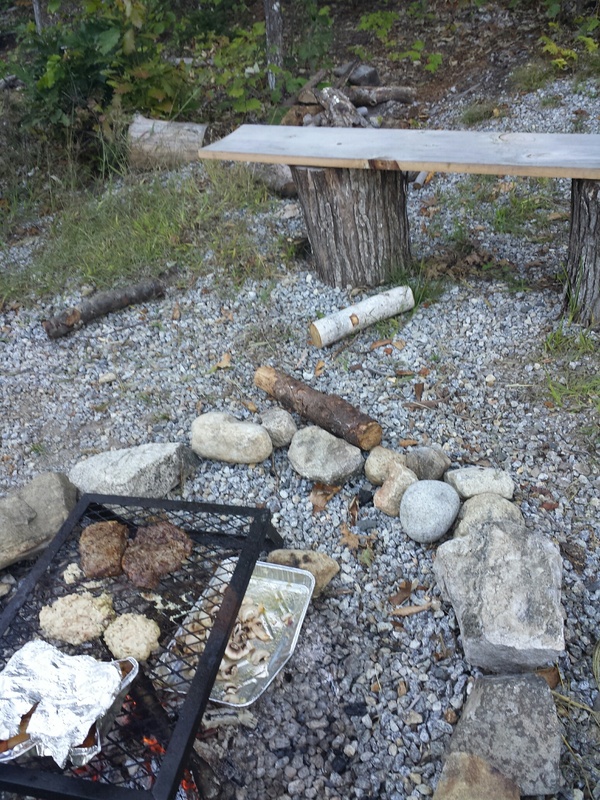 Once the campfire settles down a bit, we’ll be ready to start grilling. We ate dinner outside around the fire, just relaxing, breathing the nippy air, and reliving and relishing summer adventures and looking forward to Fall. Life is good. It is the day after 9/11. I have been thinking how one best commemorates and memorializes such a day of devastation. To be frank, lately I’ve been feeling rather demoralized. Thanks to social networking and the news, I often feel bombarded by depressing information and trends. One can say, “Well, just don’t read/look at that stuff!” but to do otherwise is to bury one’s head in the sand. Our world is becoming increasingly evil, and we simply can no longer sit back in our recliners and watch the world go by. I think many people are unaffected by world current events for a variety of reasons. One reason is location. Many times things are geographically far removed from where one lives. This is especially true in Maine, where people feel somewhat immune not only to the world’s problems, but to problems in American cities. 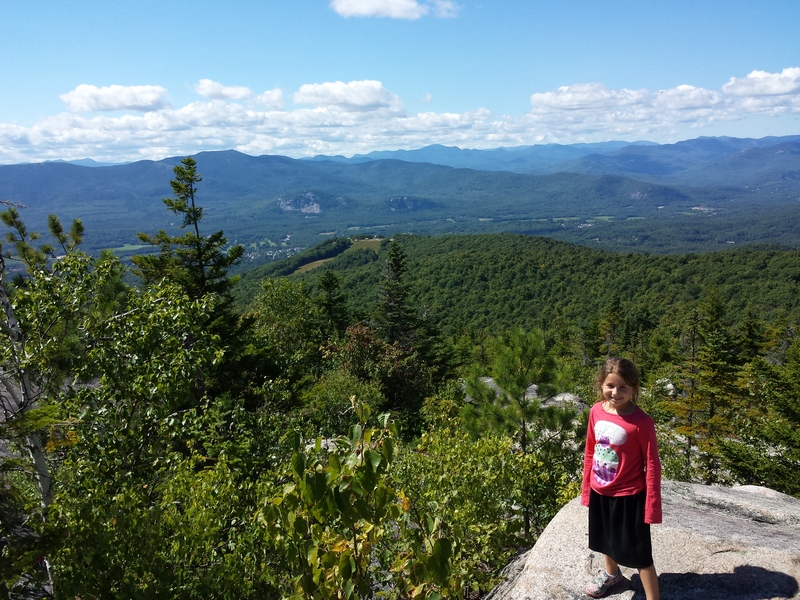 That is one of the reasons people choose to live in Maine and raise families here, after all – – one can separate oneself from many of the problems, politics, racial and religious intolerance, rude behavior, materialism and crime that typically plague cities! Especially in America, where life is relatively easy, people take the pursuit of happiness very seriously. We have incredible personal freedom. It is difficult to fathom true evil and what our lives would be like if it came knocking on our doorsteps due to a lack of actual experience (thank G-d!). One reaction is “prepping.” I have studied “prepping” to some degree and confess to a somewhat morbid fascination with it (click here for a prepper’s vocabulary tutorial). There are many, many aspects to prepping that are extremely commendable. It is certainly worthwhile for EVERY household to have emergency supplies on hand, from first aid to water to a non-perishable food supply. Anyone who has been without power for a week or more due to a natural disaster can attest to how quickly things deteriorate, and how important being prepared can be. Now if things get dire, believe me, you are going to be looking out for your family first. But die-hard preppers take this to an extreme, at the expense of community and community spirit. More than anything else, even the incredible outright miracles that people experienced, what I gained from reports from Israel during the recent Gaza war, was this very intense community support and team spirit that not only did not lessen the quality of their community and individuals’ lives; the people were empowered and sustained by it. There were countless stories of acts of selfless giving and sacrifice, for the good of community. Despite constant danger and threats against them, people were not demoralized; they actually became stronger, knowing that everyone was working on behalf of the other, together. People under constant bombardment in the South of Israel were welcomed into the homes of total strangers in the North of Israel. They were given meals, beds, rest, and sympathy at no charge, and were invited to stay at these strangers’ homes for as long as they needed. People from all over Israel baked, cooked, and bought meals for soldiers, which the civilians brought to the front; they sent socks and personal hygiene items and even bullet-proof vests along with personal notes of encouragement. There was an unprecedented amount of unity and love; and that, even more than fighting an enemy, was what gave people strength and a feeling of hope. I am going to say something harsh: we don’t have a monopoly on chesed (lovingkindness). I am addressing this specifically to Jews and Catholics, since both groups are renowned for their amazing charity work. When charity work is done in the name of religion, especially when done through organizations, it’s easy to be proud of one’s accomplishments. It’s ironic, isn’t it, that charity work, which should be the most humbling of work, instead fills us with a sense of pride? But even more important than giving money to worthy causes: how many of us would give ourselves. I don’t care how wonderful a person you may think you are, until we are faced with a life-or-death situation, NONE of us knows how we will respond. We can only hope and pray that we have the courage to take action; to step up to the plate; even if it comes at the cost of our own lives. Many Jews (and Catholics, too) are schooled with the idea of self-sacrifice for a higher purpose. Catholics have their martyred saints and Jews are told inspiring stories about people who made heroic choices during the Holocaust, for example. This is all good. But we need to step outside of our religion, I believe, and devote some time to stories of heroic deeds that are done by average people, people who don’t necessarily share our culture or our religion or are super-beings or saintly giants. Because when evil is at our doorstep, we need reassurance and encouragement that there are still good, everyday people in the world, even if they are not like us. When times get rough,we are going to be dependent on one another, not just people who are our c0-religionists or from the same culture. Which brings me back to 9/11. There are lots of public memorial ceremonies all around the country. It is also natural that children will not be as affected by 9/11 as are adults, since they didn’t experience first-hand what took place in America that day and for them, these memorial services will have less of an impact. I therefore think that every school in America – – especially parochial schools – – should devote the first 2 hours of the school day on 9/11 to videos about that day. But not only videos showing the tragedies – – videos showing the triumph of human spirit, so children can see not only that even one person can make a difference, but that when people join together, they can make an even bigger difference and make life worth living. That people are good, and that yes, they can combat evil. There is hope for mankind. Here are two examples of videos I find appropriate to memorialize 9/11, especially for children in school as well as those of us adults who need a little moral fortitude now and then. The people in these short documentaries are true heroes, but really they are “simple” people with very profound messages. The first is called Boatlift, An Untold Tale of 9/11 Resilience. Narrated by Tom Hanks, it is about the largest evacuation by sea in history: the rescue of civilians from Manhattan by boat during 9/11. To put this in perspective: the 2nd largest evacuation by sea in history was during WWII in Dunkirk, when 339,000 British and French soldiers were rescued over 9 days. On 9/11, nearly 500,000 civilians were rescued by boats in an unplanned mission in just 9 hours. The second video is called The Man in the Red Bandana. It is about a young man who sacrificed his own life to save others during the evacuation of the South Tower, and how his red bandana brought his family, friends and community closure and meaning. This video forces us to confront ourselves and ask, what would we do? And then we can only pray that we live up to G-d’s expectations that we have the proper strength of character; that we reach into some hidden deep pocket of our soul and emerge triumphant in spirit. There is something to live for; and it is greater than all of us as individuals.